Papyrus in Edmonton | Papyrus Watch - Exposing the overuse of the Papyrus font. 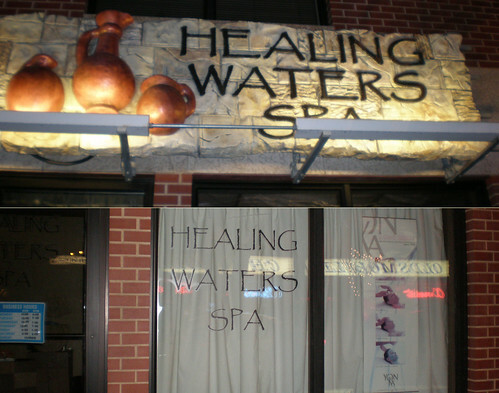 Healing Waters Spa, our first Edmonton sighting from Edmonton correspondent Megan. This is form Whyte Ave, old downtown, putting Alberta on the map. The thing with this is, the sign looks like it cost a hell of a lot of money, and is pretty nice otherwise. The bottom shot in the windows gives it an oriental feel, to me. Side note: check out the store hours sign, does that fit? Can you not get a custom one, for probably $5 form Staples?